The Men's Shed fills a vital role in the well being of men by providing a place where men can communicate, interact and ponder life’s little problems. In doing so men develop a sense of meaning and value in their life, all of which facilitates a willingness to communicate all too often uncommon in men. 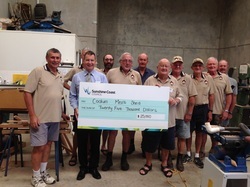 Coolum Men’s Shed looks to a future of fostering a communication between not for profit groups in Coolum, the wider community, and through our affiliation with Australian Men’s Shed Association, a network of Men’s Sheds throughout Australia.